I get the 08.14 from London Marylebone on a Wrexham and Shropshire train as far as Thame Bridge Parkway and then a get a local West Midlands unit for the rest of the way. 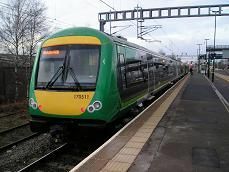 After coming via Coventry we leave the main line into Birmingham at Stetchford and take the avoiding line as far as Aston where we join the line from Birmingham to Lichfield on the left. It's a heavily industrialised area and Aston station has two lines in and two lines out. It was rebuilt in the late 1970's and has two red brick shelters and signs saying "Alight here for Aston Villa FC." The line to Lichfield goes off on the right and we then go under the A38M Aston Expressway and onto an embankment. We pass Aston Villa's ground on the left, whilst on the right is wasteland. We soon come into Witton station, which has a white/grey building on the right platform. The land after the station looks like it is ready for redevelopment with large flat open spaces. We then go into a cutting and then under the A34 before coming into Perry Barr station, which has two different shelters, one perspex and one brick on its two platforms. We then pass parkland on the right and playing fields on the left and plenty of modern housing. A line goes off on the left into Birmingham and then we are joined by the third part of the triangle. We go into another cutting and then come into Hamstead station, which used to be called Great Barr. It has a nice looking wooden clad ticket office and waiting room on the opposite platform. We pass modern looking semis on the right and wasteland on the left. Then it's another cutting and we go over a canal and then its wide-open flat land again with some trees on the left, followed by high-rise blocks of flats. We go into a cutting and under the M5 and over the Tame Valley Canal, and then slow for Tame Bridge Parkway station, which is also a newish looking station, built in 1990. It has the usual small shelters on its two platforms, as well as a modern ticket office and waiting room on the top of the embankment in which it is situated. We pull away and go straight into the middle of Bescot yard, which is full mainly of ballast wagons and IMERYS wagons. The M6 is elevated above us on the right and you can see the RAC Control Centre next to it. We then pass through Bescot Stadium station, which has the usual shelters and is next to the depot. I can see a few rusting Class 37 hidden in the distance on the left. We then go under the M6 and a line leaves us on the left towards Wolverhampton and we pass Walsall FC's Bescot stadium on the right, followed by some industrial units. We go into another cutting and then an old line and some sidings appear on the left, the electrified line from Wolverhampton joins our line from the left as we pass Walsall signal box on the right and slow to about 20 mph. There are also some overgrown sidings on the right with an old goods platform, before we come into Walsall station, which has three platforms. Platforms 2 and 3 are on an island with a nice canopy over them. There is a more modern class 332 EMU unit in platform 3. About ten people get off whilst only three get on. We are meant to wait two minutes, but it is more like five. We go into a tunnel and out onto non-electrified line. The trackside is very much overgrown on both sides. We then go into a deep cutting for the next two miles, then emerge to see new housing being built on the left and parkland on the right. The freight only line to Nuneaton goes off on the right, whilst we pass industrial units on the left. There are now three lines on the left and a freight line on the left, followed by Bloxwich signal box. There are also some overgrown sidings on the left and then we come into Bloxwich station, which is in a cutting. There are dark blue bus shelters on each platform, whose roofs are all mouldy and there is graffiti in them. No one gets on or off, except the driver to pick up a silver chain left lying on the platform. As we leave, we pass modern housing on both sides of the track and only go about half a mile before stopping at Bloxwich north station. It has two blue shelters, which are graffiti free and they are not going mouldy as they have an open front. No one gets on or off. We leave along an embankment and see new housing on both sides of the track, before going out into the countryside. On the left are open fields with sheep in them. On the right is scrubland. There are some sidings on the left, but they are overgrown. We see cows on the left and housing on the right. The land is mainly flat with a slight rise on the left, and then we go into a cutting, before emerging at Landywood station. It has a blue shelter on the left and nothing on the right. There are houses on both sides of the track here. A Freightliner train comes through on the other line from Rugeley Power Station. There are new houses on both sides of the track, with an embankment on the right hand side, and a football ground beyond that. We pass through the former station of Great Wyrley, where the remains of the platforms are in situ. We then go over the M6 Toll Motorway, with a tall hotel next to it, all shimmering with green tinted glass. Then there is some light industry on both sides, as we slow for Cannock station. We are on an embankment with new houses on both sides, as we come into the station. It is a modern looking station, and has two blue shelters built into the fencing. Ten people get on. There are newish looking industrial units on the left, and plenty of trees on the right. We are now starting to go uphill a little as we pass newish detached houses on the left. We then go onto an embankment, as we pass a mixture of industrial units and housing on both sides. Then we enter a cutting, before emerging at Hednesford. It has two blue shelters, which are clear of graffiti. We pass Hednesford No 1 signal box on the left, followed by trees on both sides, before entering another cutting. We emerge to wasteland on both sides. Then it's another cutting, with a red sandstone bank on the left and trees on the right. We are now passing through Cannock Chase for the next few miles, doing a steady 50 mph. The woodland eventually clears and you see the odd cottage on the left with large gardens, including one with a vegetable patch and ducks and geese. The landscape becomes wide open again, with rolling cornfields on the left. We enter another cutting and pass a semaphore signal and slow down considerably as we come into Rugeley Town station. It has the usual blue shelters and is on an embankment. No one gets on, though a few people do get off. You can see Rugeley Power station on the right and before the station, a signal box, which controls the lines into and out of the power station. It has the quaint name of Brereton Sidings signal box, though there are no sidings to be seen! You can see Rugeley Town centre below us on the left and rows of red brick terraced houses on the right. The track bends to the left and soon we join up with the West Coast Main Line to our right and then come into platform 3 of Rugeley Trent Valley station. It is all ultra-modern with concrete and steel shelters on both platforms and a lot of express and freight trains speeding through it.